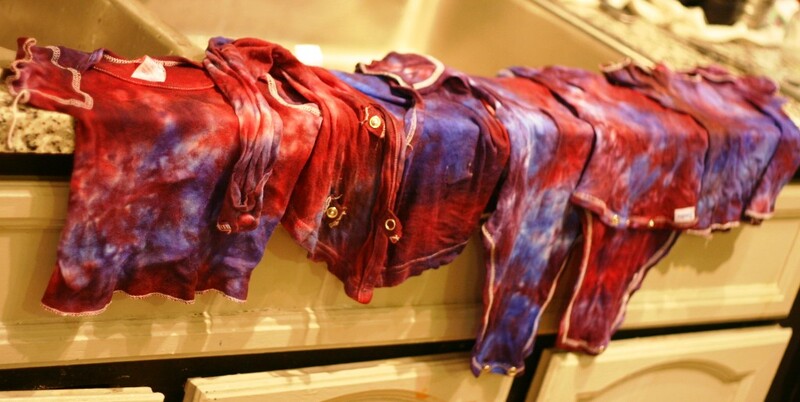 I posted a few weeks ago HERE about how I was taking all my stained baby clothes and dying them. Duh, I don't know why I hadn't thought of it before (especially considering that my brain functions so well most days). 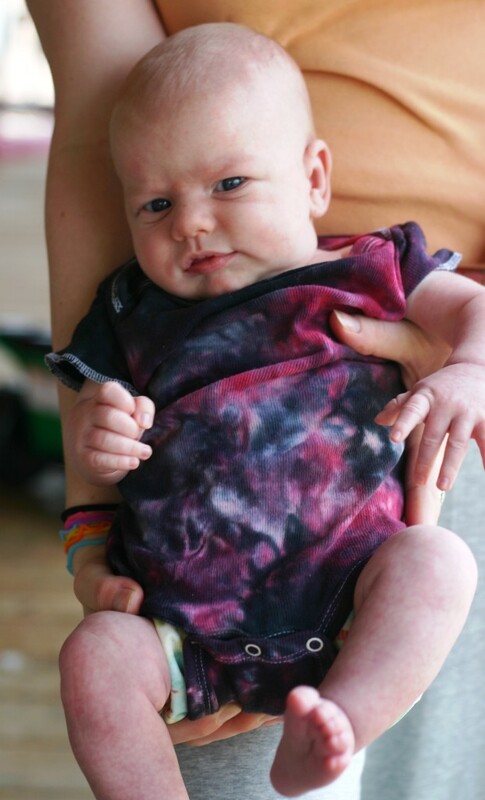 I did the baby onsies, t-shirts, and then the kids tees and some prefolds too. So as promised, I am sharing how I did it. It was super easy really. 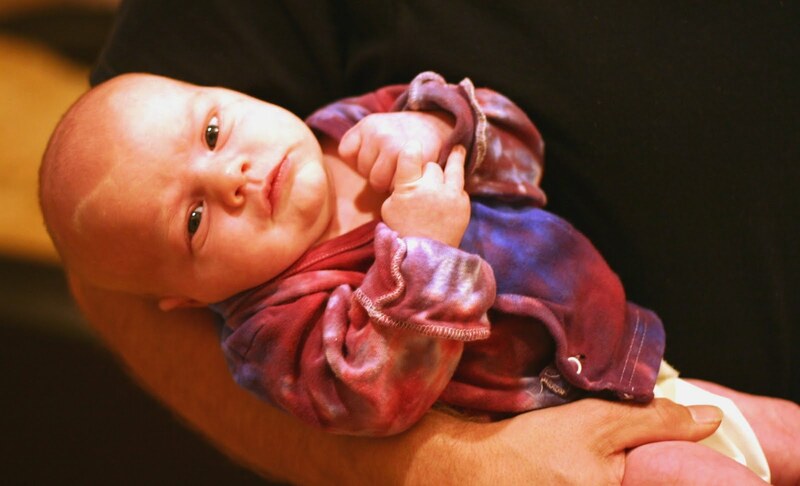 The look is that of tie dye, but it isn't technically I don't think. It is called low water immersion dying or LWI (detailed instructions below). 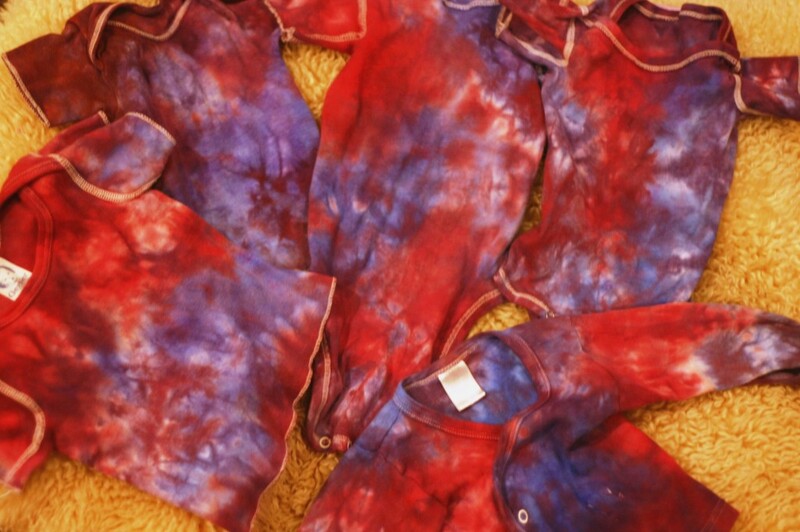 Those of you who are reading and dye clothes often (or even to sell) know that Dharma and other fiber reactive dyes you get online are superior to anything you can find in the store. But I was looking for something that I could just run out to the store to buy. Actually I was trying to keep from having to spend too much money all at once, and I could pick up a few colors here and there as needed. I used Dylon. You can get it at craft stores like JoAnns (that is where I got mine). 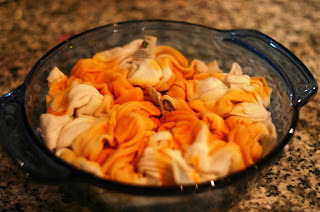 Stay away from Rit, it is a different type of dye and will bleed with every washing . . . no good. After a couple washes Dylon doesn't bleed and so far the colors have held up and still look great after several washings! What is Low Water Immersion Dying? It's easy . . .basically you are dying your fabric using much less water than instructions call for and the fabric doesn't free flow in the dye bath, rather you pour it straight on the clothes in a more concentrated form. 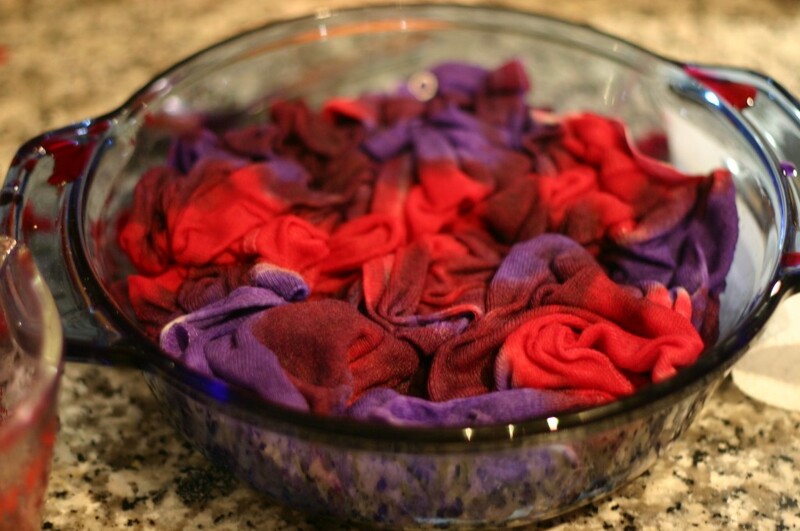 In order to get the contrast in colors/shades with LWI dying you take your fabric and scrunch it up and stuff it into a small container, something that leaves little room for the fabric to move around. 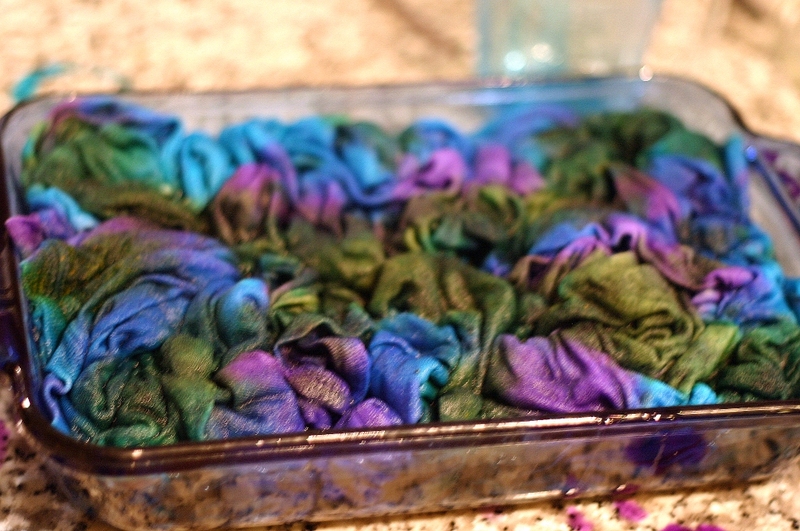 Then when you pour on your dye it soaks into fabric at different intensities since it is all bunched up. Some fabric will get a direct hit with full strength dye, the crevices and folds will just get a hint of the dye and will be much less intense. If you use 2 colors poured on separately they will blend where they touch each other making wonderful variations in color and contrast. And best of all . . . did I say it was easy? With LWI you can use just 1 color if you like. If you choose 1 color you will get the same look, with a lot of contrast and swirly patterns, but with, well, just 1 color (so you will have lighter and darker shades of the same color). I have done it with wonderful results, but unfortunately I didn't get a picture of it (it was a gift for my sister). If you choose 2 or even 3 colors you will get beautiful contrast and mixing of colors where they meet each other. You want to choose colors that will complement each other. For example the first one I did was red and blue. In the areas where the colors combine they will mix together, so my final product looked like it had 3 colors . . . red, blue and purple. I have also done 2 of the same color (light and dark blue) which was Ever's idea and I loved it! And some combos (pink and green) didn't turn out that hot. When doing black with any color remember that the black is so dark that it will completely cover any other color you add. I used the same amount of the black and red (1 cup each). Some of the shirts turned out great, with great contrast, but others in that batch were mostly black. It just depends on how much of the black got to them. So next time I'll probably use more color and about 1/2 the amount of black. Follow the directions on the back of your Dylon dye packet (as to washing and the type of fabrics recommended). I mostly used old/used shirts so I didn't need to wash them, they were clean and had been washed MANY times. I just wet them and rang them out. 2. 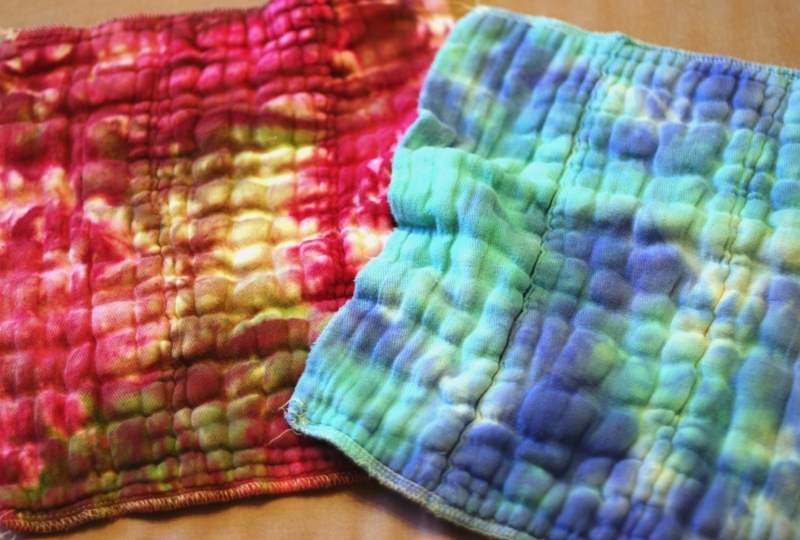 Scrunch your fabric into a small container. The idea is to get the fabric as scrunched as possible, so considering what you are dying, try to choose a container where the fabric, when scrunched, takes up the whole bottom surface. 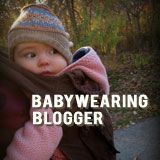 If you are doing just 1 small shirt then you may be able to use a small bowl or even a cup for a baby shirt. 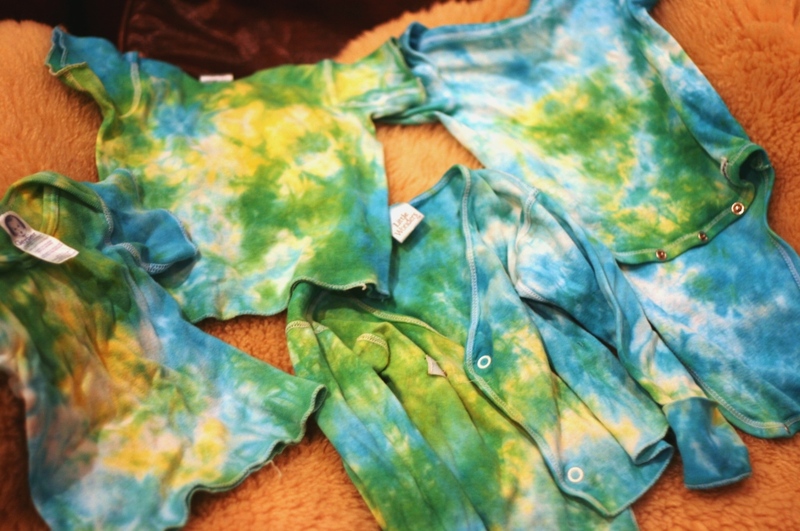 I was doing several small shirts/onsies etc. so I used glass baking dishes. This is where it gets a bit tricky (though I have done all calculations, so it should be easier for you). 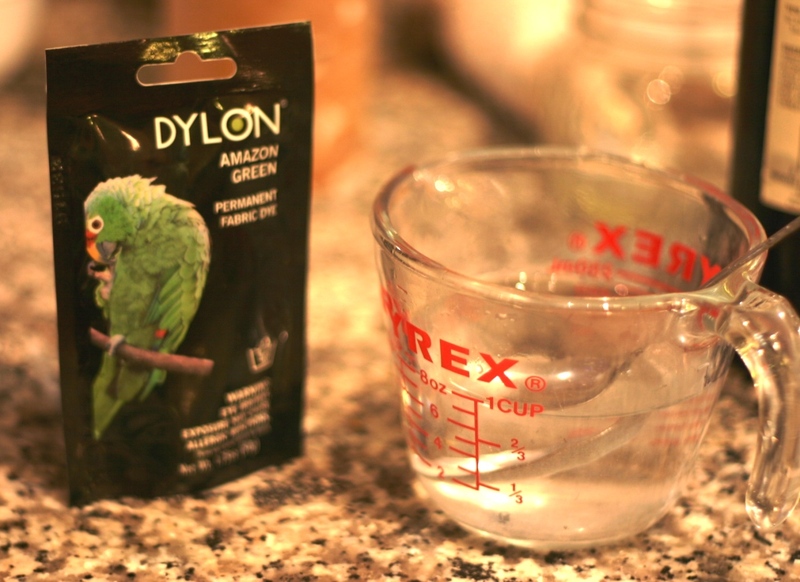 1 pack of Dylon is supposed to do 1/2 lb (8oz) of fabric. Yes, I do have a postage scale, no I am not taking the time to weigh all my fabric. 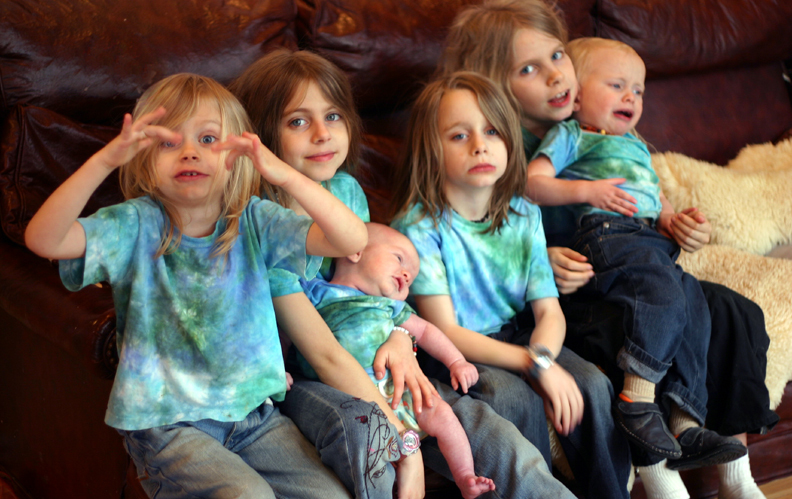 They say that 1 adult T-shirt is approx 1/2 lb, and I figure that what I am dying in this batch (onsies, kids t's etc.) 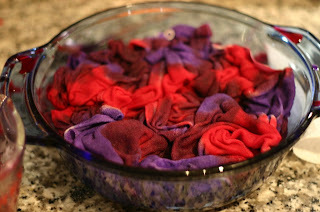 probably equals 1/2 of an adult shirt, so I am going to want to use approx 1/2 a pack of dye. I am winging it here (no worries, they turned out great). I want to mix 2 colors so I am going to use 1/4 pack of dye for each color. 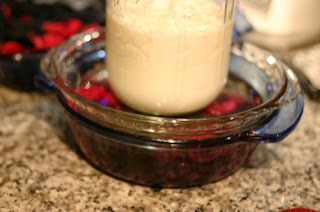 The instructions say to mix 1 pack of dye with 4 T. salt and 4 cups of water. 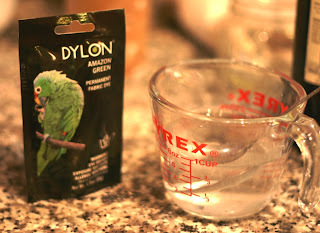 I measured the dye and each packet has approx 4 T. of dye. So that means that when dying with Dylon, per packet, you will have 4T. of dye, per 4T. of salt, per 4 cups of water. So you decide how much of each color you want to use. Not to get too crazy, but since there are 3t. 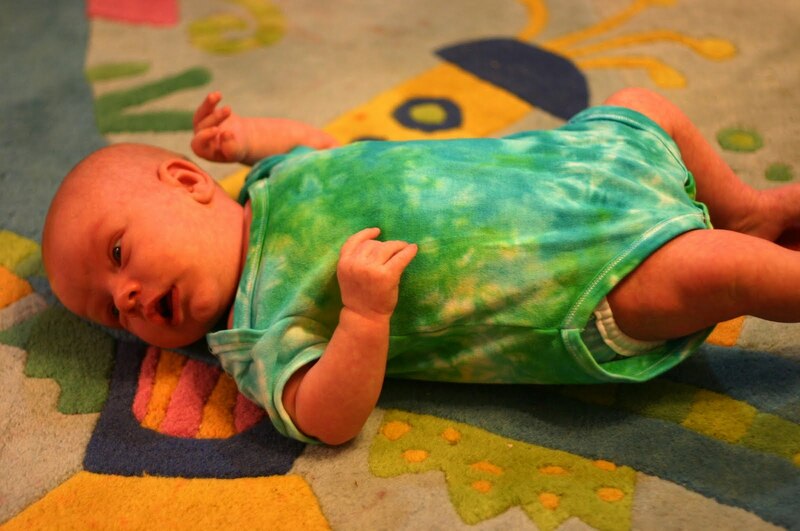 in 1T if you were doing something smaller, like just 1-2 onsies, and you wanted to use 2-3 colors . . . you could go as small as 1t. dye, 1t. salt per 1/3 cup of water (you get the way it works). You'd also probably be using a much smaller bowl or a cup even to scrunch them in. So when doing LWI with Dylon, for the amount of clothes I am dying in these pictures (approx 1/4 lb, give or take) I am using 1 cup of dye per color (each cup containing 1T dye and 1T salt). That is pretty much the formula I use. If you are doing more than I am here, and want to use 2 colors, you may want to do 1/2 packet per color (2 cups per color, each containing 2T dye and 2T salt). So, is that as clear as mud? 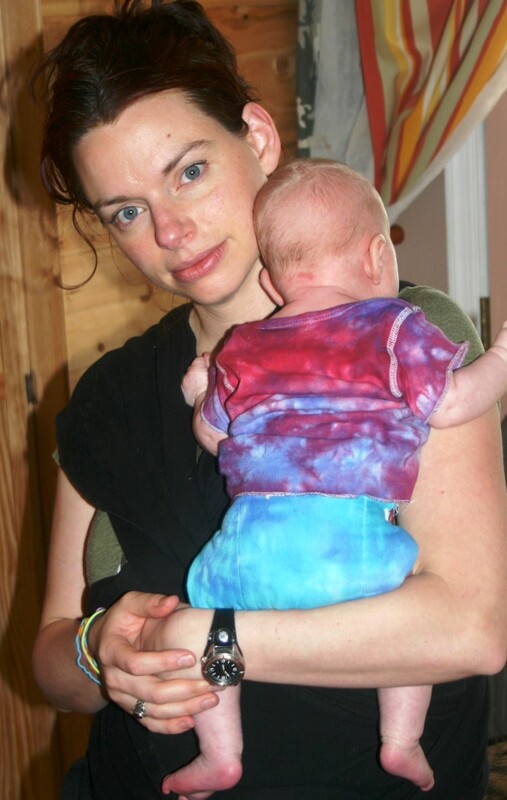 I am cheap so I wanted to use as little dye as possible, and though I am pretty sure I used less than recommended for the weight of the fabric they still had vibrant color, I think in part because I was just pouring it straight on. Note . . .the packet says to add your cup of dye to a basin of water, but just skip that part, we are pouring the dye directly on the clothes we do NOT want to dilute it further because we are not dying the whole article 1 even color (and that is what the instructions on the packet are for). If you are doing only 1 color cover all the fabric, if you are doing 2 or 3 colors you want to pour them on 1 at a time, leaving some white areas for the next color (so that each color hits the fabric directly, and they can then blend where they overlap). When doing 2 colors, I do the lighter color first, then the dark. For the batch above I did more shirts, so I used a larger container and 3 cups of dye, a different color each (1T of dye and 1T of salt per 1 cup of water for each color). I used 2 blues and a green. 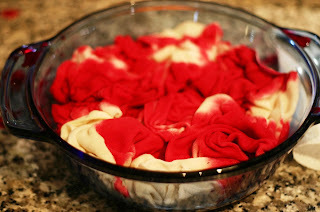 You want to make sure the fabric is completely covered with dye, and no white showing. There should be plenty of excess dye water surrounding the fabric (it won't soak up all the dye, it should be mostly submerged in it). I liked using glass because I could look underneath to make sure the dye got all the way to the bottom and that the fabric soaked it up well. 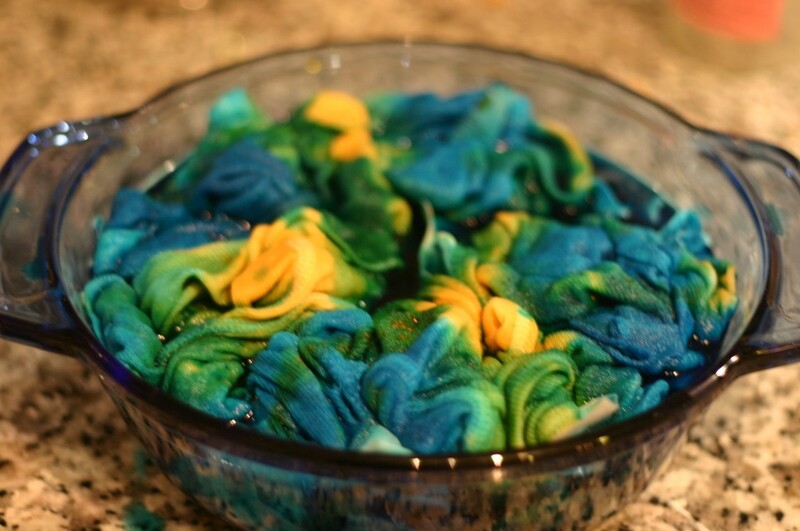 If you feel that you haven't used enough dye to completely soak into all the fabric, then you can either add more dye or add a little water to mix with the existing dye in there and get your fabric submerged a bit more (I have done both and they worked just fine). Most people recommend not moving the fabric much at all, so that the colors don't mix too much and you get more contrast. However, I noticed that some of my fabric had white spots where the dye didn't reach it at all, and I didn't want that. So now I will poke the fabric down into the dye and even maybe lift it up just a tad and drop it back down, to help the dye get into the folds a bit better. This is something you have to just experiment with. You have no guarantee how it will come out, you just have to wait and see. Which brings us to our next step . . . When leaving the dye to sit in the dye water, I put a weight over the fabric to submerge it, most anything that fits inside your container will work. I used a pie plate that fit inside the baking dishes and then I put something heavy on it. That pushed the fabric down in the dye more. I think it would still work fine if you didn't do this, but a lot of people recommend it. I like to let it sit like 4-6 hrs. I have not experimented much with the time and the results but I figure longer won't hurt. If I couldn't leave it as long I would probably microwave it in like 30 sec increments for a couple minutes, just to make sure that the dye took well. I did it for one batch that I did before bed so it only sat for an hour or so, and the results were fine. I figure it can't hurt. Well actually it could hurt if your fabric was dry. 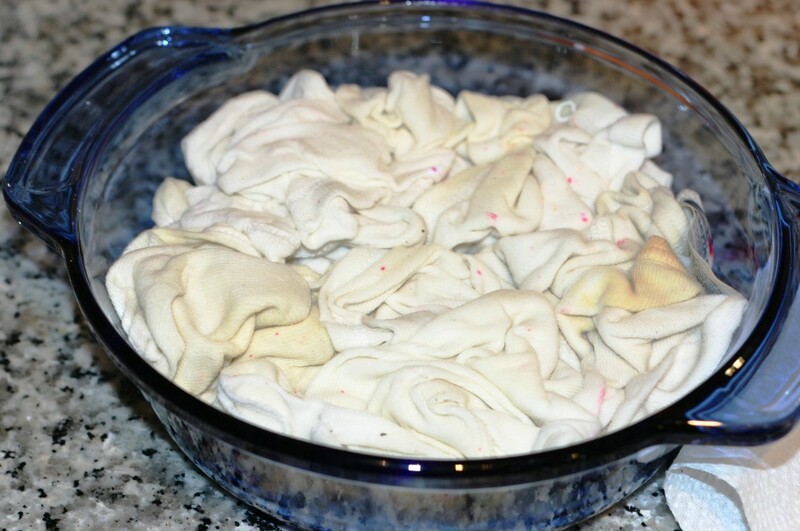 Make sure to only microwave WET fabric!! And you have now saved all those stained t-shirts that would have otherwise been thrown away (or used as rags) and THAT saves money!! 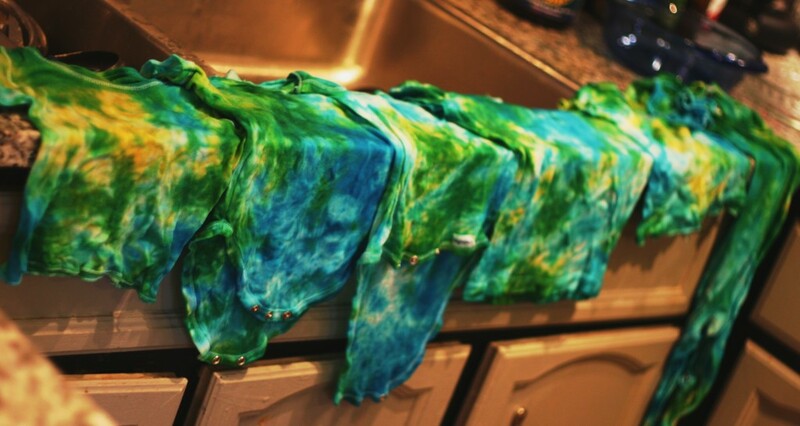 OR you can dye your diapers, cloth napkins, slings or carriers, curtains, sheets or pillowcases. 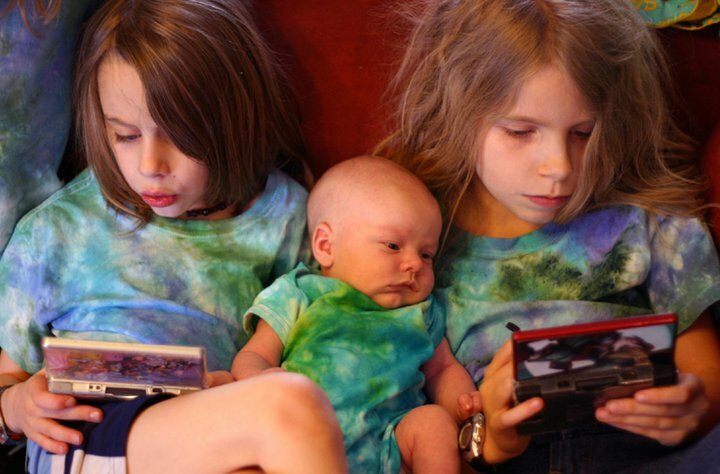 Let the kids design their own clothes (if they are like mine they are particular about the colors they want) or do matching shirts for the kids or family. We like to wear the same color shirts when going to like an amusement park, to help us keep up with each other, and I try to dress the kids in bright colors at the park so I can find them amongst all the kids easier. If you end up trying this out, feel free to send me the pictures (spiraldane@yahoo.com) and I'll post them here!! Some random kids . . . no clue what their deal is but they look like trouble to me! !